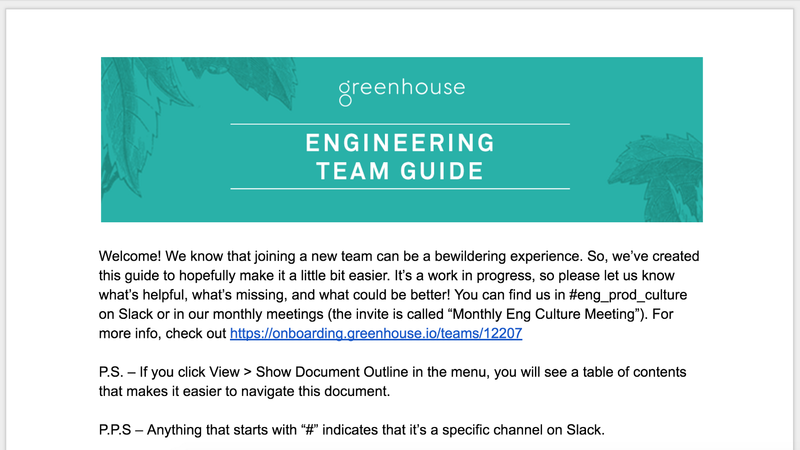 For the past year and change, I’ve been organizing the Engineering Culture Club at Greenhouse Software. We work to continuously improve our team’s culture and create opportunities for people to practice their leadership, project management, and communication skills. This is an overview of what we do and how we do it. Future posts will go into more detail about the projects we’ve done, the challenges we face, and our plans for the future. Let’s start with logistics. We hold monthly meetings to provide updates to the team on our projects and give people a space to discuss things on their minds. We have a Slack channel for general discussion and separate Slack channels to organize projects. We use Jira to track projects and action items and hold a weekly stand-up catch up with each other. We currently have projects in flight around our onboarding process, blogging, and learning & development (both cross team and within the engineering team). Ideas for the initiatives and projects we work on come from the team and are informed by the priorities of the team and the company. One recent project was to create the Engineering Team Guide. We share this document with new hires to help them acclimate to a new team and company, and introduce them to bits of implicit knowledge about our culture. For example, we describe all the different team meetings they can expect to participate in, all the learning resources available, and highlight some popular Slack channels and conventions. This document is collaboratively written and continuously updated as we notice new things to include or get feedback from our new hires. Another recent initiative is around our company tech blog, In the Weeds. We want to help our co-workers increase their visibility in the tech community, starting with blogging. To accomplish that, we wrote instructions for how to publish a blog post, created a pool of shared blog post ideas people can use as inspiration, track the status of blog posts in Jira so that they can be discussed during team stand-ups, and hold regular blog post workshops. At these workshops, people can bounce ideas off each other, ask for feedback, share writing techniques, and review each others drafts. The Engineering Culture Club is designed explicitly to be operated by and for the team. Engineering managers participate by providing context, but all of the work (the decision making, prioritization, implementation, etc.) is done by team members. It’s an empowering experience, to be able to identify and fix things on our own. It’s a venue for people to bring up things and be heard, to feel a sense of ownership for improving the team, and to be supported by their peers in sharing responsibility for projects and actions. The skills we use to get things done are transferable to our day to day responsibilities and help us be more fulfilled and productive at work. Organizing and participating in Greenhouse’s Engineering Culture Club is a lot of work, but it continues to be super rewarding. I’m consistently impressed by the range of ideas that people bring and their persistent motivation to make things better for themselves and for their co-workers. Over this next year, I’m excited to continue evolving our culture and share our journey. Thanks to Matt Schmaus and Aaron Gibralter.